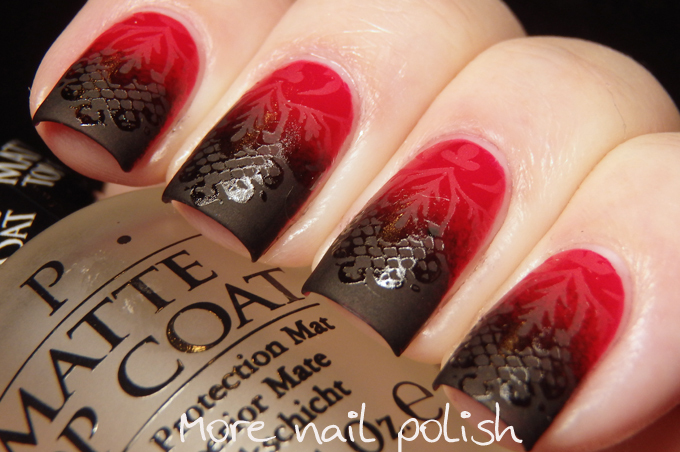 Today starts another week of Digital Dozen manis, and this weeks theme is Vampy. I think it's fair to say that this would be one of my least favourite themes every. I'm not a huge fan of really vampy dark shades on me and when I think vampy my mind draws straight to red and black, both colours that I actually don't wear a helluva lot. 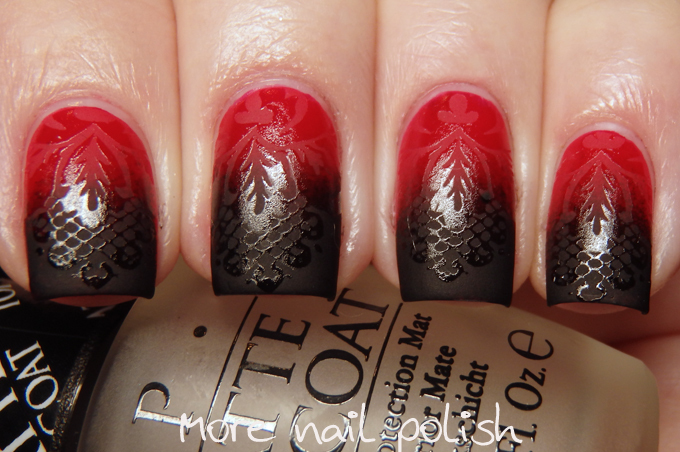 That said, if you like dark polishes, and have a particular fondness for red and/or black, then you will really love this week, cause that's just about all I have for you! I've already finished all my five manis for this week, and this one is actually the one I like the most. I figured I'd start on a nice high note before pulling out the other rather ordinary designs. For this mani I used Ulta3 Black Satin and Pretty Serious Hell on Wheels in a two toned gradient. I topped that with OPI Matte Top coat, which I'm in desperate need of buying a new one! I right down to the dregs and it was a miracle that I didn't end up with white lumpy bits on my nails from the matte top coat. Once that was dry I used Essence Gel Look top coat and stamped with it over the matte polish. That's it, you don't need to top coat otherwise you loose the cool effect of the glossy and matte finishes. This was actually the first time I had used Pretty Serious Hell on Wheels. In the bottle it looked like a bit of a pinky red, but on the nails it was pretty special, and that's really saying something from someone who doesn't really love reds. I like the colour so much that I actually used it for two more manis this week. 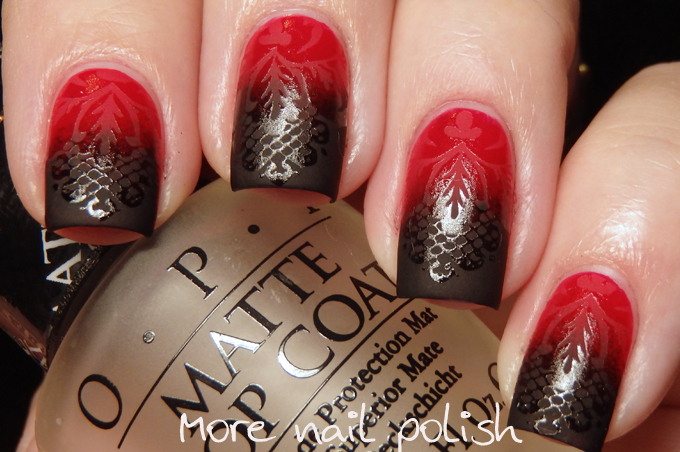 That matte stamping over the gradient....OH MY GOODNESS! Amazing! 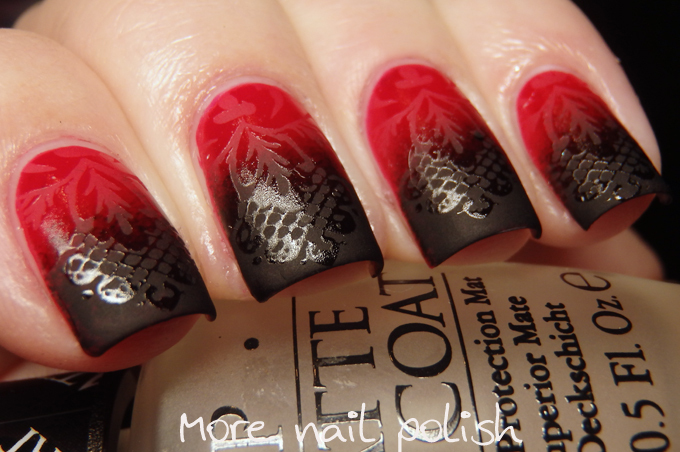 I love this look and I may have to recreative it in some way - gradient with matte stamping - LOVE! I'm still loving this mani. I really should try a mani like this myself. Wow, these are stunning! You make me want to learn how to stamp!